The use of iPads in medicine has been growing and it is quickly becoming the must have tool in the hospital. Many academic medical libraries have gotten into the business of loaning iPads to physicians, just the same as they would loan a book. The libraries at the Nova Southeastern University, Virginia Commonwealth University, and University of Central Florida are just three examples. Medical libraries outside of the United States are also placing iPads in the hands of doctors. The Central Medical Library at the University Medical Center Groningen in the Netherlands started off by loaning three iPads. Its program has been so successful they have added another five to the rotation. Details of their program can be found on their wiki page. How physicians are using the iPads is not surprising. Amanda Chiplock MLS, the Acquisitions Emerging Technologies Librarian at the Nova Southeastern University Health Professions Division Library reported that most of the physicians who borrow their iPads are using them for teaching and presentations (45%) or videos and research (40%). Because users can install apps on the same device, doctors who check out an iPad can use their personal apps along with institutionally supported apps that are pre-loaded. After the iPad is returned to the library, the individual still owns and has access to any of their purchased apps because they were purchased through their own personal iTunes user account. The apps that are pre-loaded on the iPad vary at each location. Many come with apps specific to the institution’s medical programs. Some libraries have loaded utility or office type apps like Apple’s iWork apps, QuickOffice, Docs2Go, DropBox, Evernote, Penultimate, Adobe Photoshop Express, iBooks, and Kindle. One area that has proven to be a challenge has been allowing access to the hospital EMR through the iPad due to IT security concerns. However, there are several hospitals that have worked out the security issues and have integrated the use of iPads into their EMR systems. Palmetto General Hospital allows Nova Southeastern University library iPads to access the EMR and iPads are able to access EMR at the Mayo Clinic as well. Even though these hospitals are currently the exception to the rule for providing access to secure parts of the network, Dr. Robert Hasty, D.O., FACOI, Assistant Professor of Internal Medicine at Nova Southeastern University College of Osteopathic Medicine and Program Director of Palmetto General Hospital Internal Medicine Residency thinks it is the future. Even if a library isn’t loaning iPads, it may already have an extensive list of institutional resources such as ebooks, databases, and other sites for doctors with iPads to use. Many have created lists guiding doctors to apps and mobile friendly resources that are free or are paid for and available via the library’s subscriptions. Several are listed on the iMedicalApps Forum. Excellent article! Thanks, Michelle. I just wanted to clarify that the iPads used at Palmetto General Hospital with Dr. Hasty’s residents are part of the NSU residency program at the Hospital and are not HPD Library iPads. HPD Library iPads are prohibited from connecting to any clinical applications, including EMR. Still, Dr. Hasty has worked miracles to securely connect any iPads to the EMR. Palmetto General is one of the very few that we know of that allows the connection at all. We are very proud to be part of such innovation and progression. Thanks for this mention of our lending project at UMCG Michelle! Thanks Amanda for that clarification. It is always very tricky as to what can get on the secure network to access the EMR and how. Our open house is set for April 30th. We encourage all health professionals and students interested in seeing the technology firsthand to check in with their library. 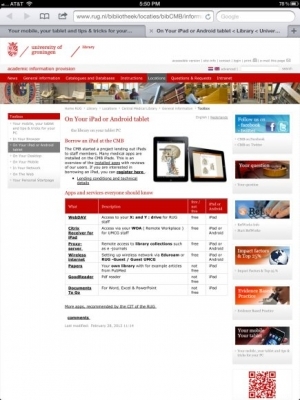 ALA has a great site of information links, based on a recent webinar, for anyone interested in adding iPads to their long list of customer services: http://www.alatechsource.org/blog/2012/03/continuing-the-conversation-integrating-ipads-and-tablet-computers-into-library-service. The launch of the iPad resulted in considerable enthusiasm for the device, especially among busy physicians. Even Pharmaceuticals and Life Sciences are using an iPad-CRM Approach- that means issuing iPads to their field reps and using a robust CRM that can be accessed with multiple devices like CRM on iPads ( http://bit.ly/q26VRR ). The allure of having a common platform between pharma rep, physician and patient has resulted from its ability to share applications and facilitate communications. Good article. We at ACT Health Library, Canberra, Australia has 30 iPads for loan to medical students,clinicians, and nursing staff. We are loaning iPads since 2011 and very popular among the users. iPads have access to the library webpage and productivity applications. Arizona Health Sciences Library, Tucson Campus, has two new iPads available for checkout to AHSC faculty, staff and students. They are set up similarly to the description in Michelle’s post above. We also have a Libguide (http://azhin.org/ahsl-mobileresources) that gives an overview. Additionally, all of our liaison librarians and our outreach librarian have iPads so that they can help students, faculty and other library users with app questions and perform their jobs on the go.